The final countdown to Book Yer Ane Fest IX is on and we are getting equal parts excited and nervous for what is going to be our busiest weekend of the year. 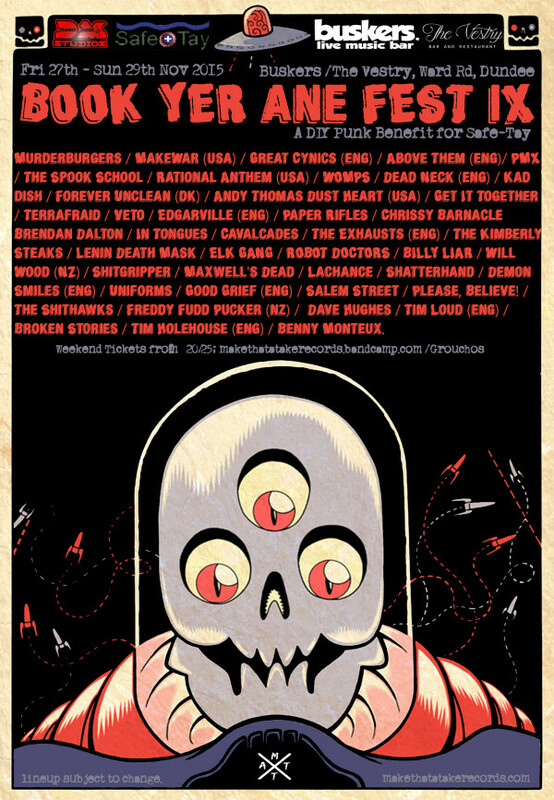 The healing powers of punk rock are more important now than ever and we’re very happy to be able to bring over 50 acts from across the worldwide DIY community together in Dundee over three days. This is the first year that we’ll be hosting Book Yer Ane Fest at Buskers on Ward Road, Dundee with a second stage at The Vestry next door on both the Saturday and Sunday. 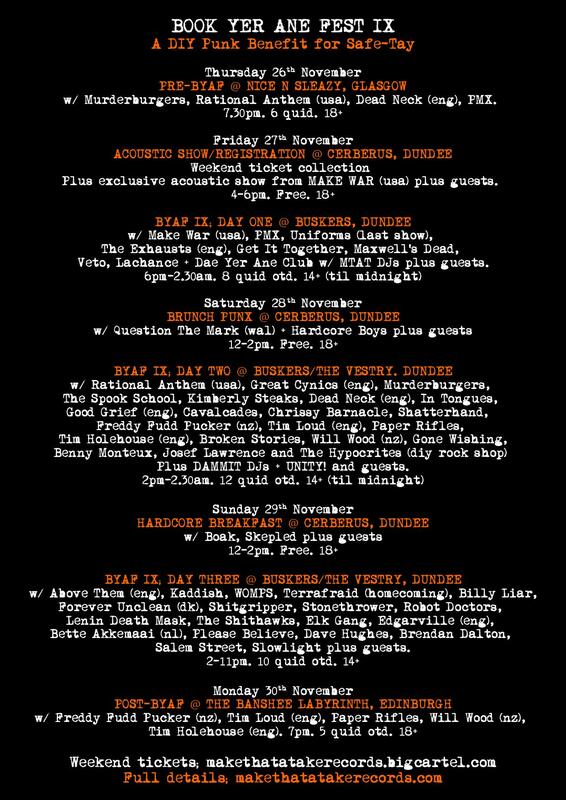 There will also be early shows at Cerberus Bar in Dundee on all three days. We’d like to thank everyone involved in the planning and organising of BYAF, espeically our hosts and the good people at DM Studios in Dundee. To us, Book Yer Ane Fest is a celebration of the DIY community and what we work towards each year. It’s also a chance to see some incredible bands, catch up with old friends, make plenty of new ones and have an amazing time while raising money and awareness for water safety and suicide prevention. We are very proud to continue working with Safe-Tay and the Samaritans. There will be various information/literature available for perusal over the weekend so please do take a moment to check it all out. We shall also once again be hosting the World Famous BYAF Tombola! Pre-BYAF happens in Glasgow on Thursday 27th November at Nice N Sleazy and Post-BYAF wraps up the long weekend at The Banshee Labyrinth in Edinburgh on Monday 30th November. Weekend E-Tickets are available for £25 here and are in person at Groucho’s, Dundee. Both the pre and post-BYAF shows are pay on the door. There will be individual day passes available on all three days at Buskers/The Vestry on a first come, first served basis. Likewise, for all shows at Cerberus as it’s tiny! Keep an eye on the event page and our Twitter for all updates including any last-minute tip-offs about things that may be happening. Full information on Day Splits with links, etc is available here and you can also check out the Write Yer Ane Zine “BYAF First Timers” preview. We are also very excited to have two new releases coming out at BYAF; the new “Swells/Repels” EP from Dundee Ecossemo punks Stonethrower and an exciting new collaborative project involving two of Scotland’s finest acoustic punks. Full details to come soon. There will also be various stalls. record sales and loads of merch for sale so come well prepared. This will also be the first BYAF with a “proper” stage so please behave accordingly. Reckon we could all be in a for a hearty rammy! We do hope we’ll soon you there!